Today’s Guest: Cynthia Kraack, speculative fiction author, Ashwood trilogy: Ashwood, Harvesting Ashwood and Leaving Ashwood. Mr. Media is recorded live before a studio audience of ambitious, future agricultural estate mistresses… in the new new media capitol of the world… St. Petersburg, Florida! Order ‘Ashwood’ by Cynthia Kraack by clicking on the book cover above! Visions of the future tend not to be too hopeful. And I, being a generally optimistic, positive thinking fellow, don’t often go down rabbit holes that lead to nattering nabobs of negativity. I encounter enough of it in the normal course of daily business — why look for trouble? But I got sucked into Cynthia Kraack’s new small press novel, Ashwood. It tells the story of Matron Anne, the new administrator of an Ashwood, Minnesota, agricultural plantation — worked and maintained largely by children — some time in the not-too-distant future. In Matron Anne’s era, danger lurks everywhere in America, from the cities to the rural farming communities. She’s a young woman whose life has already been hard; when she begins telling us her tale, she has no idea the challenges and dangers that lie ahead of her. 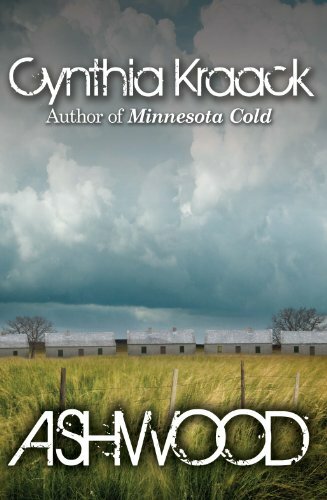 Order ‘Minnesota Cold’ by Cynthia Kraack by clicking the book cover above! Ashwood offers a touch of speculative fiction, economics forecasting and a bit of science fiction. It would make a brilliant, edgy movie in the right hands. If you’re looking for a story with a strong female lead, look no farther. If you’re looking for a tale in which people come together and overcome evil for a common good, this is a reading commitment you won’t regret.